Furnishing: friendly, homely, tiled floor, wooden floor. detached house, 6 people, 5 room/s, 4 bedroom/s, 1 bathroom/s, approx. 90 m², 2 floor/s, year of construction 1954, partially renovated 2016. Bedroom 2: (floor 1): single bed (0.75 m wide, 1.90 m long), bunk bed (0.75 m wide, 1.90 m long). Bedroom 3: (floor 1): 2 x single bed (0.80 m wide, 1.80 m long). Additional information: direct access to bedroom no 4. Bedroom 4: (floor 1): 2 x single bed. Dining area: in the kitchen, (ground floor). Kitchen: Kitchen/ cooking equipment: 4 induction fields, oven, microwave oven, dish-washer, refrigerator, coffee machine, water boiler, freezer approx. 60 litre. open to the living room (ground floor). Living room: (ground floor): furniture suite, wood-burning stove, exit to terrace. Estate: (private use): approx. 2500 m², open plot, natural surroundings, meadow. Information on the boat(s): Rowing boat (10.0 foot; included). Outdoor facilities: (private use): terrace 11 m², further terrace 22 m² (protected from wind), furnishing provided, transportable barbecue. 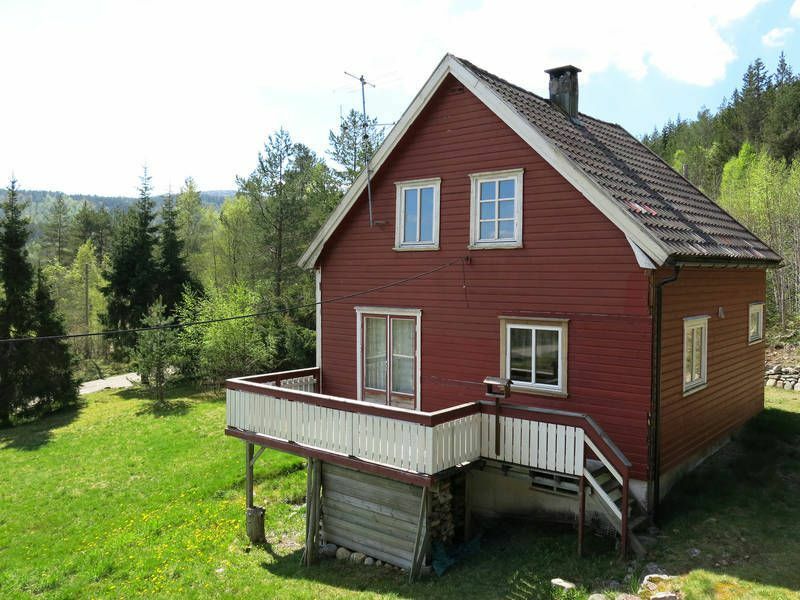 Situation: detached position, rural, lake-view, view of Egsåvatn. Arrival: Airport Kristiansand Kjevik in approx. 89 km. Ferry port Kristiansand in approx. 85 km. Train station Audnedal in approx. 44 km. Beach/waters: Lake in approx. 180 m (See Egsåvatn). Sandy beach in approx. 180 m.
Nearest neighbour: Nearest neighbour in approx. 300 m.
Next village/town: Center Kyrkjebygd in approx. 20 km. Kristiansand in approx. 85 km. Mandal in approx. 80 km. Shopping: Next shopping possibility (Kyrkjebygd) in approx. 20 km. Next supermarket (Evje) in approx. 44 km.